The Final Five are taking New York City by storm. The gold medal-winning U.S. women's gymnastics team visited the Empire State Building Tuesday morning as they begin a whirlwind media tour after their incredible accomplishments in Rio. Their Kellogg's Tour of Gymnastics Champions will officially start on Sept.15, in Spokane, Washington and end on Nov. 13 in Boston. They will visit 36 U.S. cities and showcase gymnasts from 2012 and 2016, according to Kellogg's. 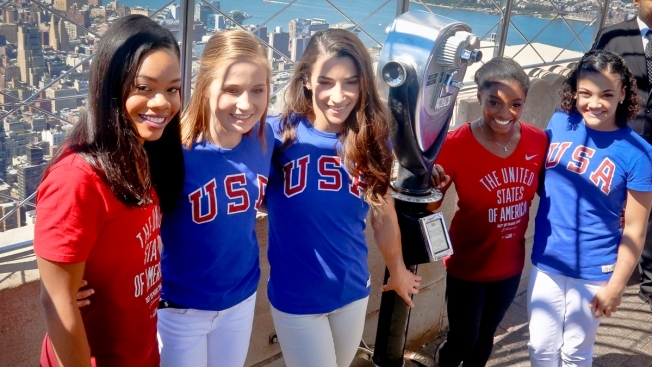 Hometown hero and breakout star Laurie Hernandez, along with Simone Biles, Gabby Douglas, Aly Raisman and Madison Kocian took in the view of the city from 86 floors above the ground. And it provided another first for Old Bridge, New Jersey resident Hernandez: being able to take in the view from the observatory of the Empire State Building. It's all making for a surreal experience, she said. "I used to have someone pinch me beforehand just to make sure it wasn't a dream," Hernandez told NBC 4 New York. Biles called Hernandez a "perfect fit to the team" in Rio. "She's always making all of us laugh," she told NBC 4. "I think she has a very similar personality to me. We roomed the whole time to Rio. We just love her to death." Since getting back Monday, Hernandez has been able to see her parents for a bit, and she's now looking forward to reuniting with her siblings. In the meantime, the team is hoping to "rest and eat and chill," said Douglas, who was also on the 2012 Fierce Five. Raisman, also a two-time Olympian, said "it's been a blur" since the team arrived in New York and that the intense public focus and being followed by papparrazzi has been "crazy" and "surreal." "There's just so much, you just never expect it," she said. "Laurie lives like 45 minutes from here, I don't know if she's ever experienced the craziness of New York like this. I don't think any of the girls have right after the Olympics, except me and Gabby." "Everything has been go, go, go, we haven't had time to sit down and think about it," added Biles. One thing on top of the women's New York agenda? Finding some great pizza. "Gabby will probably find us the best pizza because she's gotten pizza multiple times here, so she's probably our best best," said Raisman. As for the native Hernandez's pick? "It's all pretty good!" she said diplomatically. The team will later appear Tuesday night on The Tonight Show Starring Jimmy Fallon.